The HC-Lab Humidity Controller is dedicated to controlled protein crystal dehydration. 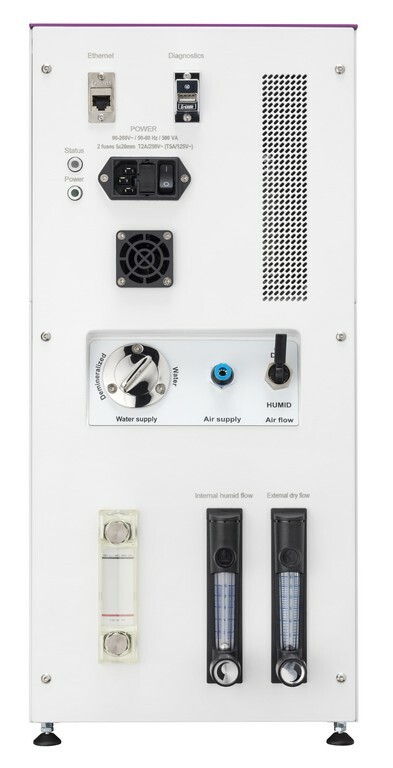 The HC-Lab delivers a continuous flux of humid air with controlled Relative Humidity (RH) for the given sample temperature. 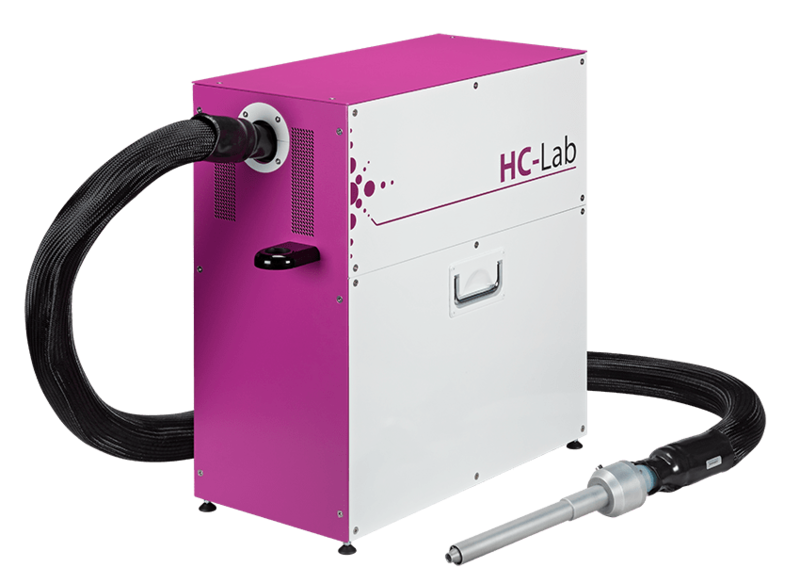 The HC-Lab is able to finely adjust the RH from 30.0 % to 99.5 % (@ 23°C room temperature) with an exceptional stability of ±0.05 % RMS. Crystal dehydration can considerably improve the X-ray diffraction quality for poorly diffracting macromolecular crystals and finally, lead to diffraction data with higher resolution. The below image shows a series of diffraction patterns which were taken during a dehydration experiment on a laboratory home source and a single crystal. The sample’s relative humidity was set with Arinax’s Humidity Controller for two different crystal orientations, = 0° and = 90°. 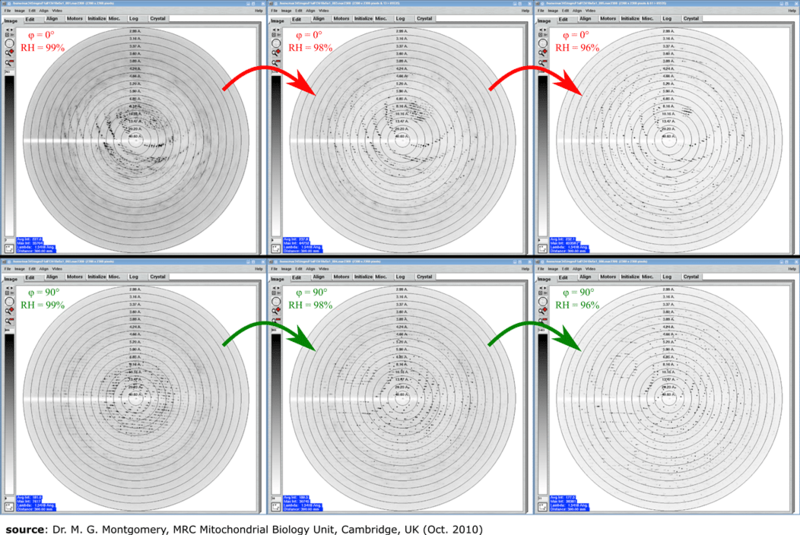 For each crystal orientation the diffraction data was recorded for successively decreasing relative humidity values. This experiment resulted in a resolution improvement from 8 Å at RH = 99% to 4 Å at RH = 96%. The HC-Lab control software exploits sample images, e.g. delivered by the goniometer’s video microscope. Depending on the RH set point the drop of mother liquor surrounding the crystal will shrink (low RH), increase its diameter (high RH) or remain stable in size (equilibrium RH). The drop size is constantly monitored by the control software via image recognition and dynamically plotted in a time diagram together with the actual RH value. 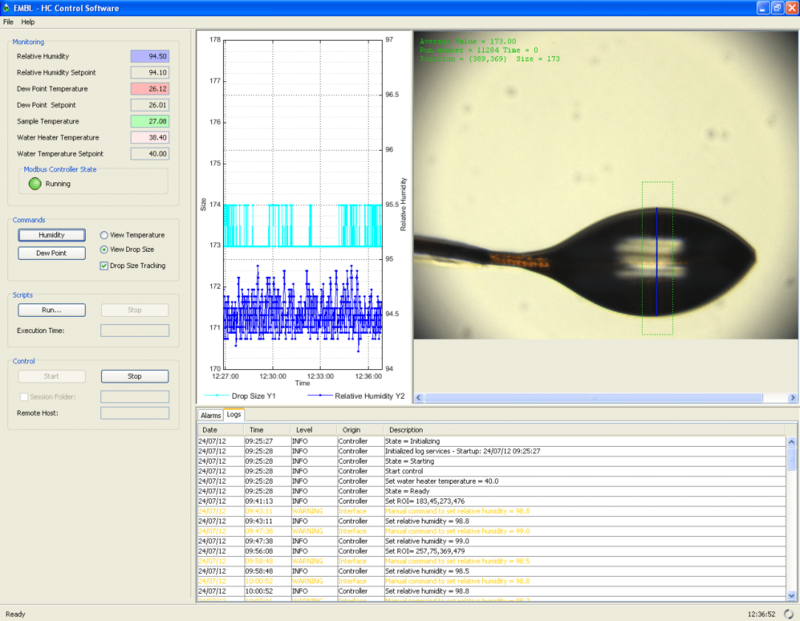 The sample visualization and the monitoring over time of different experimental parameters like drop size, sample temperature and RH value gives an unprecedented degree of control over dehydration experiments. Python scripting can be used for programming experiment cycles with varying parameters and successive X-ray data collection. Having specific questions about the HC-Lab and Crystal Dehydration? 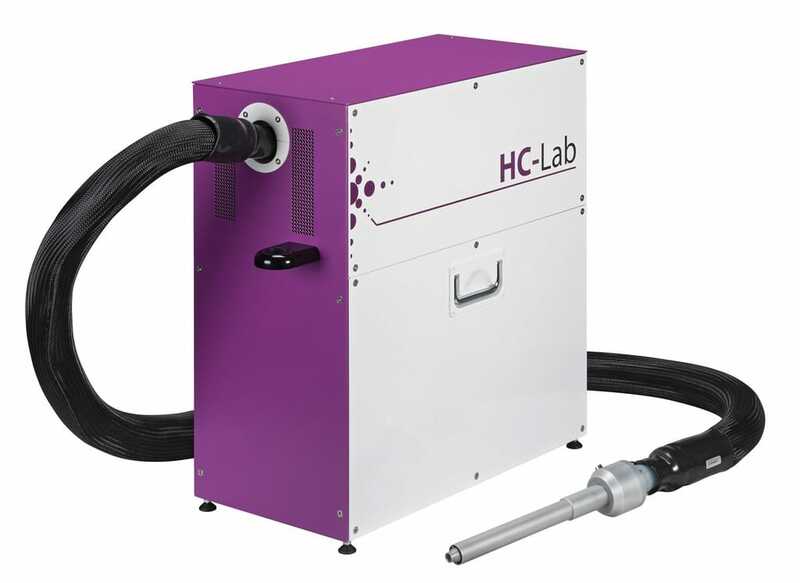 Moreover, the HC-Lab can be combined with the Rapid Nozzle Exchanger REX to automate the nozzle exchange between the HC-Lab humidity nozzle and the cryo nozzle, i.e. 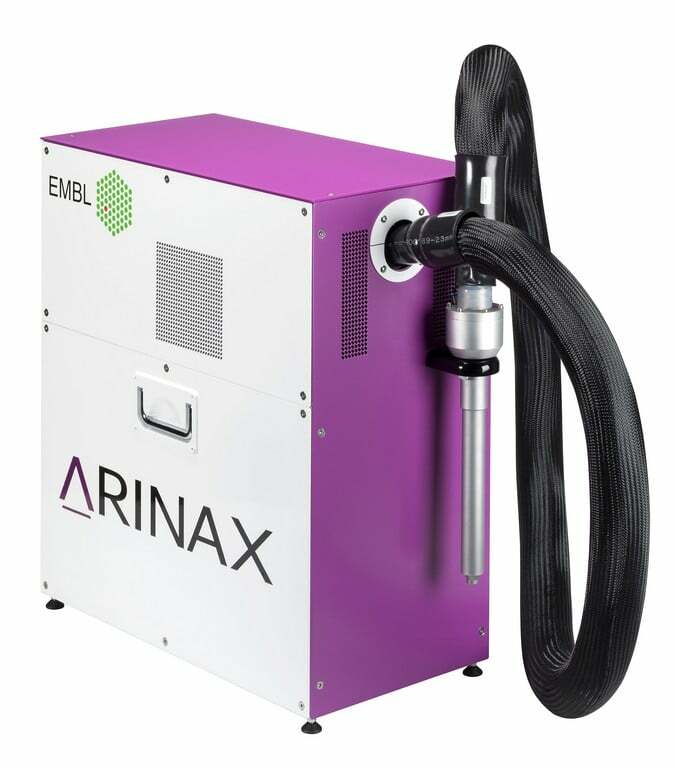 for flash-cooling, while maintaining the alignment with respect to the sample/crystal. (2017)Bowler, M.G., Bowler, D.R., Bowler, M.W., « Raoult’s law revisited: accurately predicting equilibrium relative humidity points for humidity control experiments », J.Appl.Cryst.50, 631–638. (2012)Russo Krauss, I., F. Sica,et al. « Increasing the X-ray Diffraction Power of Protein Crystals by Dehydration: The Case of Bovine Serum Albumin and a Survey of Literature Data. » Int J Mol Sci 13 (3): 3782-3800. (2011) Wheeler, M. J., S. Russi, et al.« Measurement of the equilibrium relative humidity for common precipitant concentrations: facilitating controlled dehydration experiments. » Acta Crystallogr Sect F Struct Biol Cryst Commun 68 (1): 111-114. …– Range 30.0 % – 99.5 % @ 23°C room temp.